The “Lit” concept bulb designed by Elie Ahovi is an extremely elegant and innovative combination of LED and fiber optic technology, and could pave the way for incandescent replacements of the future. “Lit” proposes that light from LEDs can be piped into fiber optics which take on a look similar to the filament inside of an incandescent bulb. A traditional Edison-shaped polycarbonate housing covers the fiber optics giving the concept a familiar look to complement any style of fixture. Created as an entry for the famed Braun Prize, Ahovi’s concept focuses on a modular set of parts that allows the bulb to be fitted with a range of screw bases. 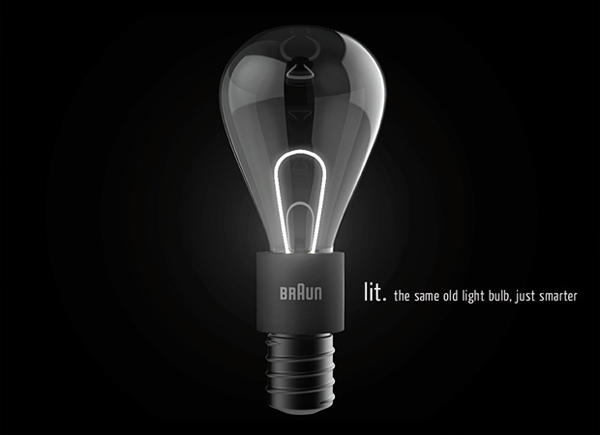 This ensures that the bulb can fit many sizes of electrical sockets. The entire assembly can also disassemble, so the polycarbonate cover can be recycled at the end of the bulb’s long life. There are many common challenges that manufacturers of LED replacements for incandescent bulbs face: aesthetics, heat management, optimal brightness, cost sensitivity, long diode life hours, weight of the bulb, and keeping a precise light color (also called Kelvin temperature). Many of these challenges start with the fact that LEDs are flat, tiny point sources, and they do not emit light 360 degrees like incandescent technology. The major manufacturers like Philips, GE, Lighting Science Group and others have been in a battle of innovation over the past few years to optimize their replacement technology with solutions that force the flat spot LEDs into a form that will illuminate a round bulb. Ahovi’s concept takes a totally new approach to this by using the fiber optic material to pipe the light into the globe. It is hard to say if this hybrid bulb could achieve the same high light output as LED replacements we are seeing on the market, while keeping the design to such a small package. Hopefully the concept can be further explored and tested by lighting manufactures. It is really exciting to think about getting rid of the offensive spirals and claw-shaped incandescent replacements, and bringing back a cleanly designed light source that you can enjoy without a shade! its really helpful to know how electrical system technology is varying in the technical field. Wow! 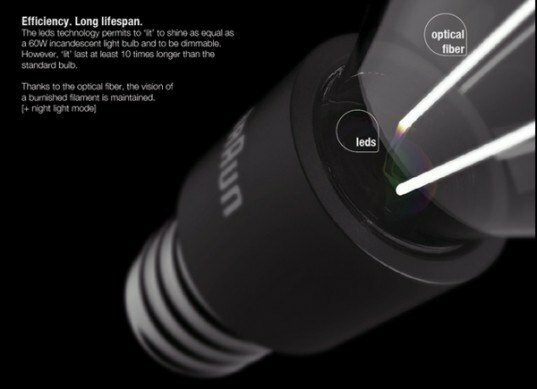 LED technology delivering a fiber optic product. Imagine a world of lamps without shades or an array of clear and controlled light that doesn't hurt the eyes. It's only a matter of time before fiber optics truly take over the world. To learn more about how fiber optics is literally making a global impact go to fiberoptics.shopbuynenjoy.com. The "Lit" concept bulb designed by Elie Ahovi is an extremely elegant and innovative combination of LED and fiber optic technology, and could pave the way for incandescent replacements of the future. "Lit" proposes that light from LEDs can be piped into fiber optics which take on a look similar to the filament inside of an incandescent bulb. A traditional Edison-shaped polycarbonate housing covers the fiber optics giving the concept a familiar look to complement any style of fixture.